Is your Mac mail not responding? Do you want to know some manual and trouble-free method to solve the problem? If yes, go through this article and explore two most popular solutions to fix Mac OS Yosemite 10.10.5 mail problems. However, before that, let us know more about Yosemite 10.10.5. When users try to open mails they find that Application is not responding or crashing. The major reason behind this problem is, upgrading Mac OS X to the new latest version. As a result, there will be handling issues with the previously saved state of email. At that time, mail application not responding problem generates. Therefore, to resolve the problem, the prior saved state of mail should be removed and re-launch the mail. Therefore, to delete the previously saved state of mail users have to follow some steps, which are discussed in the next section. One thing should be remembered that user has to leave the ‘Internet Accounts‘ present in ‘System preferences‘ open. So that when the user restarts the Mac, Mail launches correctly and ‘System Preference’ gets window open. By using above-mentioned steps, users can solve Yosemite 10.10.5 Mail Problems. However, persistent of the issue even after going through manual solutions, indicates that file must be oversized. In such situations, you can use our software Mac Mail to Outlook Converter. With this software, users can easily fix the problem. The tool provides matchless feature and supports all MAC OS versions. Moreover, the resolution can be done in more precise manner with its attractive features suite. 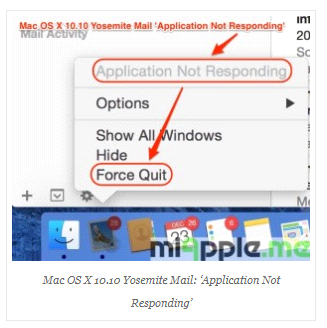 In this article, we have learned, the root causes for the Yosemite 10.10.5 Mail problems. Apart from this, we have also discussed the manual approach to resolve this issue. However, in case the problem remains unresolved with the manual approach, then it is recommended to use our tool. It works very efficiently and is the reliable solution to resolve the problem.